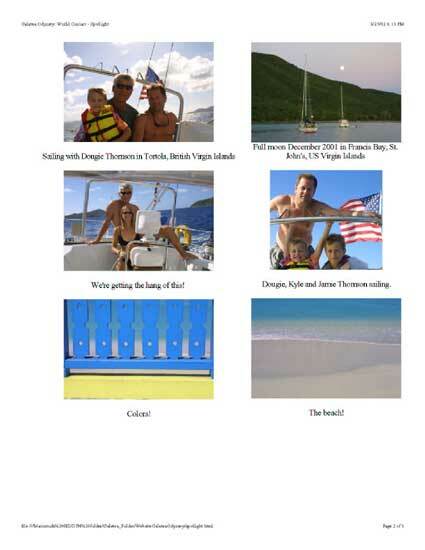 Next Port: Galapagos Islands and then westward to the Marquesas (April 2002). For more information/many more photos, look under 'Stories from our Journey' under the Circumnavigate menu. Gui and Dava enjoying teaching students from San Agustin, La Salle, and Chino Panama schools during the videoconference with Puerto Rico, Peabody High, and astronaut Dr. Jeff Hoffman. 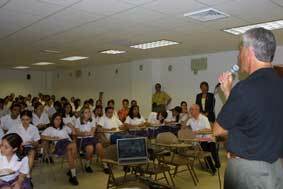 Gui teaching at Colegio San Agustin. 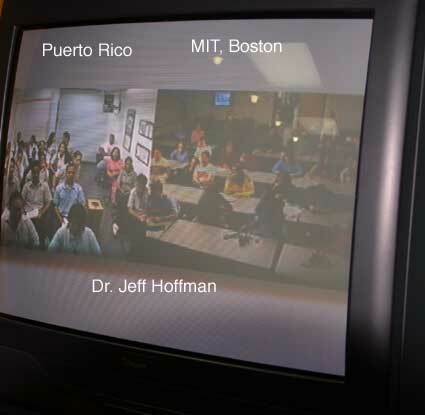 As seen from Panama, our videoscreen of interaction with Puerto Rico and MIT. We had great 3-way interaction with students from all countries asking questions of Dr. Hoffman and each other. The videoconference was featured on two Panama City news channels at 12 noon and 6 pm, March 19, 2002. The students learned a lot about life in space, the exploration of Mars, and the solar system beyond. 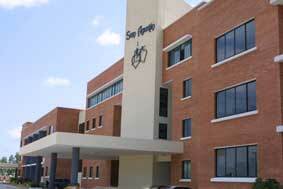 Colegio San Agustin, Panama City, Panama. What a wonderful high school! Interaction during the videoconference from the Panama site. 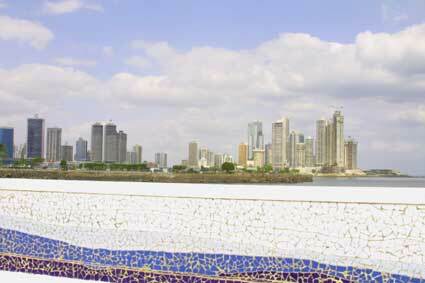 A view of the impressive skyline of Panama City from Balboa Avenue. 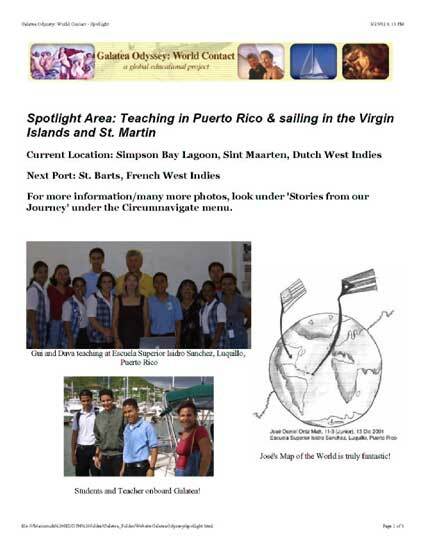 Student representative thanking us for the seminar on "Exploration in Space and at Sea". 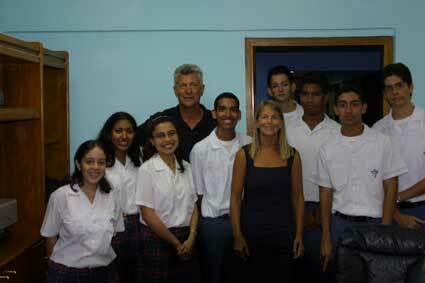 Many thanks to the Rodriguez family for making the educational seminars and videoconference possible in Panama. 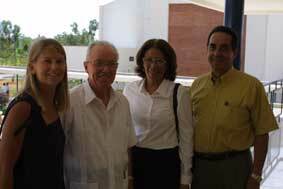 Dava with the principal of San Agustin and Dr. Marcela and Dr. Mario Rodriguez. 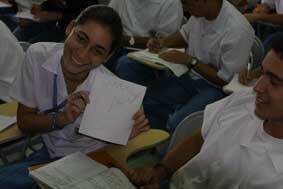 Colegio La Salle students drawing their "View of the World" maps. La Salle students displaying their work after a seminar on Human Exploration in Extreme Environments. Galatea enters the Pacific Ocean, Balboa, Panama sailing under the Bridge of the Americas connecting North and South America.